Last month, Isaiah and I attended a lovely wedding in Rancho Palos Verdes, California (in Los Angeles County). 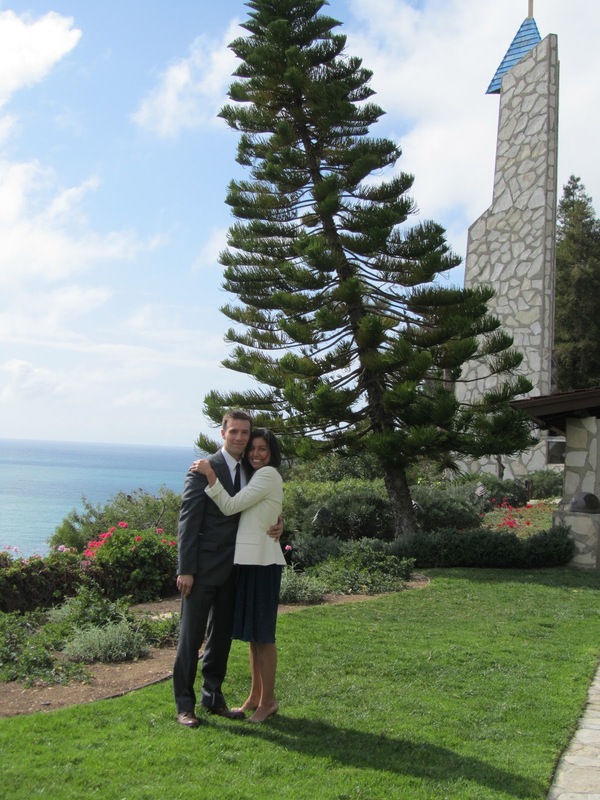 Guests witnessed the couple exchange wedding vows at the Wayfarers Chapel, a Lloyd Wright design overlooking the Pacific Ocean. The chapel itself is made mostly of glass windows and panels with some wooden and steel beams, so lots of natural light and endless sky! One of the sweetest details of the entire wedding is the story behind the venue selection: The groom is a good 10 years older than the bride and has never been married. When he was in his early twenties, he attended a wedding at the Wayfarer's Chapel and told himself that one day when he got married it would be there. Fifteen years or so later, he made it happen! Sounds a strange place for wedding. What about their honeymoon, do you ask where they will go for it? Bed and Breakfast - strange because of the name?? They went to San Francisco for their honeymoon!